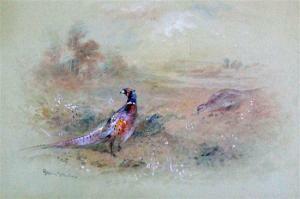 Find artworks, auction results, sale prices and pictures of James Stinton at auctions worldwide. 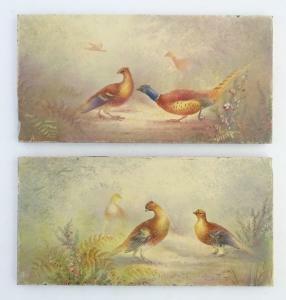 A pair of 19th C rectangular tiles with pheasant decoration in the style of James Stinton (known for being a decorator for Royal Worcester porcelain). Approx. 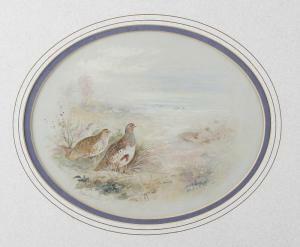 12" x 6" (2) CONDITION: Please Note - we do not make reference to the condition of lots within descriptions. We are however happy to provide additional information regarding the condition of items on request. 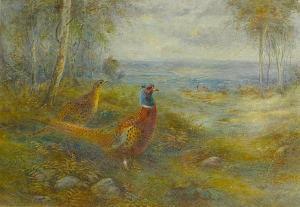 James Stinton (1870-1961)A group of pheasants crouched in an open fieldWatercolourSigned to lower edgeOval 8 x 6.5 (20.25cm x 16.5cm)In card mount and framed under glass James Stinton was the youngest son of John Stinton Senior and began work for the Grainger factory before moving to Royal Worcester in 1902 where he specialised in painting game birds. Appears in good condition within frame. The frame with few heavy losses. 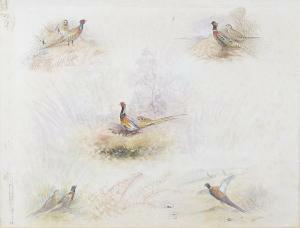 James Stinton (1870-1961)Five watercolour studies on one sheetEach depicting one or two pheasants beside foliageThree with signatures within the compositionSheet 9.75 x 7.75 (25cm x 19.5cm)In card mount and unframedJames Stinton was the youngest son of John Stinton Senior and began work for the Grainger factory before moving to Royal Worcester in 1902 where he specialised in painting game birds. The paper is heavily foxed to the right hand edge and with marks to the left hand edge from a previous mounting. Otherwise the colours appear in good condition.